We hear virtually nothing about gold start-ups these days. Established mines have conditioned themselves for a long and agonizing commodities slump, which makes the arrival of a new gold producer all the more surprising. New Gold Recovery (NGR) is a start-up gold producer operating on 3,400 acres in north-east Nevada in the US. And it will soon be available in other countries. What makes NGR unique is a proprietary gold recovery process using nano-technology that recovers upwards of 90% of gold particles – a remarkable improvement over traditional placer recovery rates, where upwards of 40% of gold particles are lost in the recovery process. 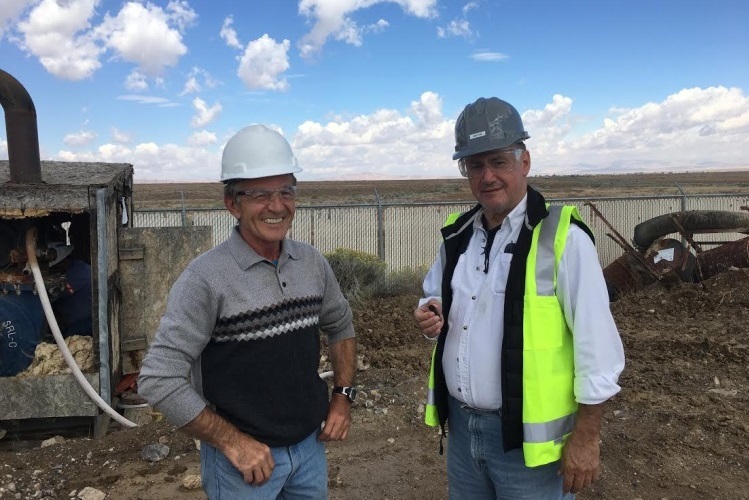 The inventor of the process and CEO of Nevada-based NGR is Anastasios Morfopoulos, who has been researching gold recovery processes for more than a decade. Tas, as he is more commonly known, believes his nano-technology process could rescue a bleeding gold sector. “The technology has been in the pilot phase for several years, and the recovery rates have been validated by independent laboratories. Now we have started production on a relatively small scale, but we will ramp up rather quickly from here,” he says. Though the system has been piloted extensively with placer mines in the U.S., Morfopoulos believes hard rock recoveries could also benefit from the technology, aptly named Tas 3 (the “3” representing the number of system evolutions). The Tas 3 system is described as the first-ever green and eco-friendly placer mining technology for gold recovery. The exact composition of the nano-technology is a closely guarded secret, but it is already attracting strong interest across the world. Morfopoulos had researched ways to improve precious metals recoveries for more than a decade, and several years ago stumbled on certain nano-particles that demonstrated a natural affinity for gold and other precious metals. The affinity was so strong that upwards of 90% of all gold particles were recovered in pilot tests. Most of the improved recovery was from the tiny gold dust particles that are typically washed away using traditional recovery methods. These particles are so small they cannot be seen by the naked eye. But they stick like glue to the nano-particles, and can then be separated from the condensate without use of mercury, cyanide and other hazardous substances generally used in this type of mining, and which are in any event banned in most countries for health reasons. Morfopoulos reckons traditional placer miners are losing almost half of their gold in the traditional recovery process, which relies on mills to separate the gold from the ore and then traps the liberated gold by means of gravity as it is washed down a sluice. But as much as half of the gold ends up in the tailings. These are the tiny particles, generally smaller than 100 microns, that do not respond to gravity-based recovery. Until now, there has been no reliable way for placer miners to trap these particles. Hard rock mines, with their sophisticated recovery plants, have much better recovery rates, but even here there is potential for improvement that NGR wants to harness. Morfopoulos says he is looking for joint venture partners in South Africa and East Africa. For the moment, his focus is on placer mining, but he is receiving tailing samples from around the world to see if recovery grades can be improved. And the good news is, in most cases, the technology shows substantial improvements. For marginal operators, this is clearly a game changer. The nano-technology is applied to a series of trays placed on a rack in a zigzag formation, trapping only precious metals as the concentrate flows over the tray formation. The dirt washes off, leaving up to 99% of the gold from the concentrate extracted. NGR originally planned to licence its technology to other primary producers, but then decided to enter mining in its own right, while still offering the technology to other producers for a share of the improved recoveries. NGR, through its wholly-owned subsidiary New Gold Nevada (NGN), acquired more than 3,400 acres of land in north-east Nevada, one of the world richest gold and silver producing region with over 50 active mines and annual production of 4.95m troy ounces of gold and 10.94m troy ounces of silver in 2014. NGR raised $5m by way of private placement, and brought in New York-based hedge fund UniCore Capital as a 20% shareholder. This gave it sufficient capital to acquire the Black Rock Canyon Mine deposit, reckoned to have $480m worth of gold deposits lying no more than 90 feet below the surface, and refurbish an old processing plant on the site. UniCore is currently raising an additional $10m for expansion of mining operations, which Morfopoulos says will initially focus on high value deposits in the south-west U.S. The company recently secured approval from the U.S. Bureau of Land Management to commence mining operations. It also secured a water permit to allow it to establish settling ponds. Black Rock Canyon has an indicated resource of 9,69,907m3 averaging 0.41 g/m3 gold and an inferred resource of 3,344,509m3 of gravel which are estimated to average 0.33-0.5 g/m3. Production started in August 2016, and the company expects to produce 1,000 ounces a month, ramping up to 2,000 ounces by 2017. That makes it a decent mid-level player. Apart from gold, the company will generate revenue by offering its technology on a profit sharing basis with other producers. The Tas 3 prototype was verified and cross-checked by two third-party inspectors: Bureau Veritas Group and Global Mineral Research, world-renowned metallurgical research labs. Given the fact that roughly 80m ounces of gold are mined each year, a small percentage improvement in recovery could mean the difference between life and death for many of the millions of mines, big and small, around the world.